The beautiful painting above is from Terry's blog Idle Speculations. Please take a moment to read what he has to say about this beautiful work of art depicting our Blessed Mother's Immaculate Conception. We praise you, O Mother of God, we proclaim you Virgin and Mother! The entire world venerates you as Spouse of the Eternal Father! Holy, Holy, Holy is the Mother of God, Mary every Virgin! Heaven and earth are filled with the majesty of your Son! You are honored as Queen by the whole heavenly court! 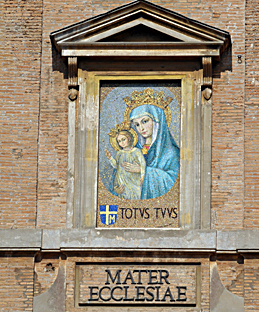 You are invoked and praised as Mother of God by the entire world and by the holy Church. You are the gate of Heaven, the ladder to the kingdom of Heaven and blessed glory! You are Souse and Mother of the eternal King, the temple and sanctuary of the Holy Spirit; the altar of the Blessed Trinity. You are the Mediatrix between Jesus Christ and men, the Advocate of the poor! 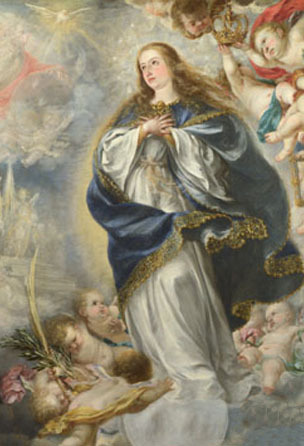 You are, after Jesus, our only hope, Mistress of the world, Queen of Heaven! We bow to yo and salute you each day, O Mother of love! Sweet and good Mary, in you we place all our hope, defend us for all eternity! Mary was in the mind of God from all eternity: "I was set up from eternity, and of old before the earth was made." (Prov. 8:23). "I will put enmities between thee and the woman, and thy seed and her seed: she shall crush thy head, and thou shalt lie in wait for her heel" (Gen. 3:15). "Behold a Virgin shall conceive, and bear a Son, and His name shall be called Emmanuel" (Isa. 7:14). "And there shall come forth a rod out of the root of Jesse, and a flower shall rise up out of his root" (Isa. 11:1). "I was exalted like a cedar in Lebanon, and as a cypress tree on Mount Sion. I was exalted like a palm tree in Cades, and as a rose plant in Jericho. As a fair olive tree in the plains, and as a plane tree by the water in the streets, was I exalted. I gave a sweet small like cinnamon, and aromatical balm: I yielded a sweet odour like the best myrrh" (Ecchlus. 24:17:20). "Behold my beloved speaketh to me: Arise, make haste, my love, my dove, my beautiful one, and come. For winter is now past, the rain is over and gone. The flowers have appeared in our land, the time of the pruning is come: the voice of the turtle is heart in our land." (Cant. 2:10-12). "Blessed ins the man th at heareth me, and that watcheth daily at my gates, and waiteth at the posts of my doors. He that shall find me, shall find life, and shall have salvation from the Lord" (Prov. 8:34-35). Quotation source: Mary: Hope of the World by Rev. James Alberione, S.T.D., St. Paul Editions. 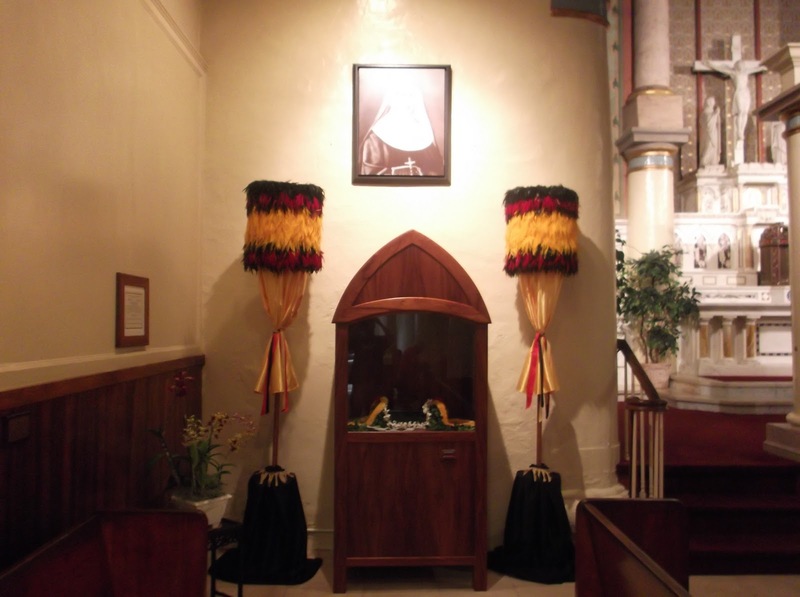 Last Reminder: Hour of Grace from noon to 1:00 PM today. A nun who dedicated her life to caring for exiled leprosy patients is a step closer to sainthood after the Vatican's Congregation for the Causes of Saints recommended her canonization on Tuesday. I think Hawaii will be the only state in the union with two saints! This is wonderful news and I am sure everyone in Hawaii is excited about Bl. 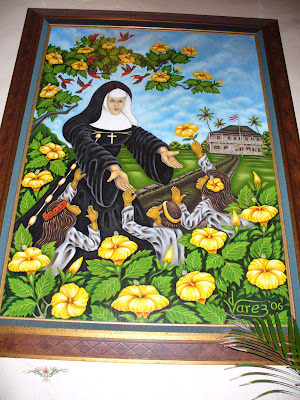 Mother Marianne Cope finally that much closer to being canonized. I must admit it is only recently that I have grown to appreciate the work she did for the Hansen's Disease patients in Kalaupapa. Before that, it bothered me that Saint Damien, then Father Damien, had so much opposition to his tireless work with those patients. It also bothered me that it took so long before Mother Marianne Cope and her sisters finally went to help Father Damien. I realize now how unselfishly she gave of herself. And, of course, I have a devotion to her too. 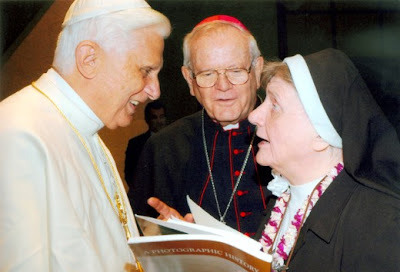 "We thank God that the Vatican Congregation for the Causes of the Saints has approved a petition to ask Pope Benedict XVI to officially declare Blessed Marianne Cope, OSF, a saint of the Church. 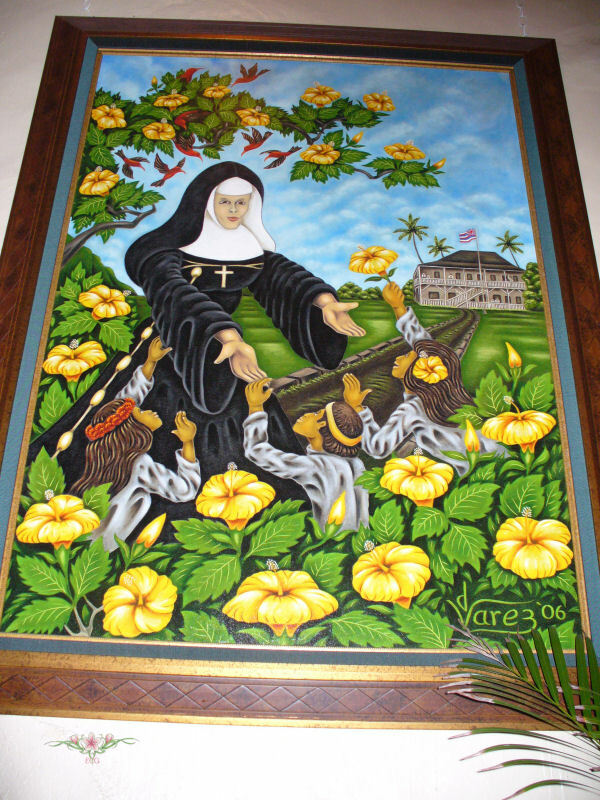 We are particularly joyful in Hawaii, because of Blessed Marianne's worked here, but her example of selfless love can soon be an inspiration to all the world. She was a woman who brought hope and joy to people who had good reason to lose hope and to lament their condition in life. At this time when so many people are losing hope because of our economy and the increased unrest throughout the world, Blessed Marianne inspires us to work simply for the good of others and to allow God to work miracles through the simple things we do. We look forward to honoring this holy woman in our celebrations, and most of all by our faith in the God who begins and sustains every good work among us." - Statement by Bishop Larry Silva, Diocese of Honolulu. 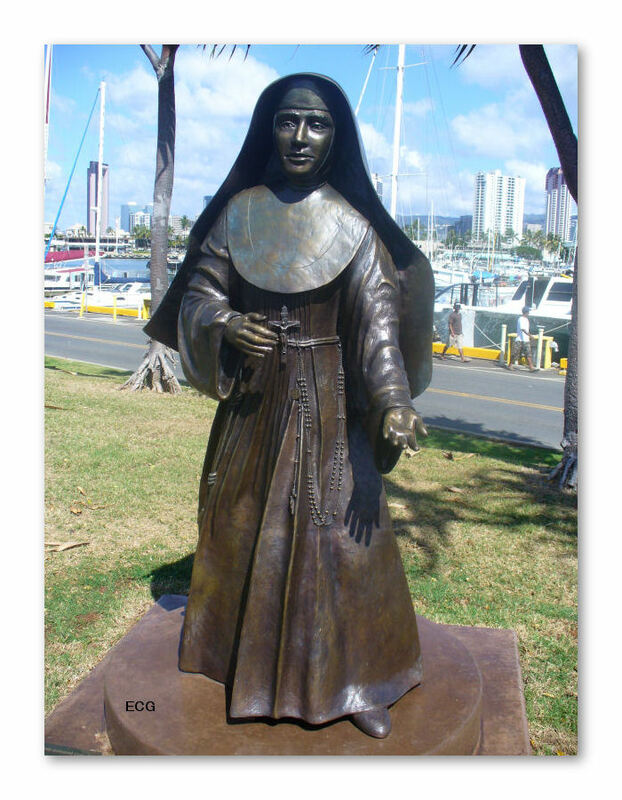 Recommended reading and source of the above is A Song of Pilgrimage and Exile: The Life and Spirit of Mother Marianne of Molokai by Sister Mary Laurence Hanley, O.S.F. and O.A. Bushnell. The international Catholic charity Aid to the Church in Need (ACN) has been elevated by Pope Benedict XVI to the status of a Pontifical Foundation. The official seat of the foundation is the Vatican. This canonical act was enacted by a Chirograph, an official document in Latin personally signed by the Pope. The initial impulse for the founding of ACN came from Pope Pius XII. Inspired by the Pope's plea just after the Second World War to reach out to the 14 million post-war refugees in Germany, the Norbertine priest Werenfried van Straaten launched an appeal for reconciliation through charitable deeds. As among other things he collected bacon, he soon became known as the "Bacon Priest." Today ACN is a worldwide community of over 600,000 friends and benefactors which support approximately 5,000 aid projects every year in over 140 different countries. In 2010 the total amount of donations came to over $115 million. The ACN benefactors are taken care of through 17 national offices in Europe, North and South America and Australia. In the Chirograph signed by the Holy Father, he emphasizes the decades-long services of ACN to the Church. Now a Pontifical Foundation, ACN will continue as before, in a spirit of active charity to help wherever the Church faces hardship or persecution. As a pastoral charity, acting in the name of the Church, it is committed to strengthening and deepening Catholic faith and moral life.